Still Creek Press wants to keep the community we work in as clean as possible, so we have asked the Burnaby community to join us to do their part to make that happen. 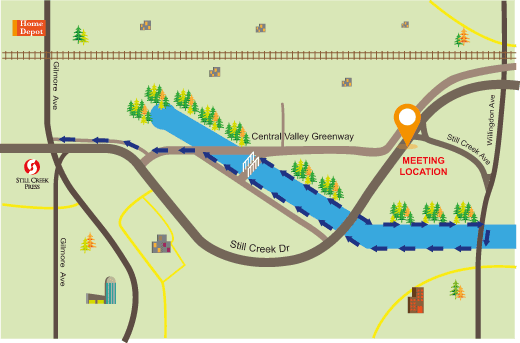 Businesses will be joining us May 14th, 2015, we are meeting up at 2pm on the corner of Still Creek Avenue and Still Creek Drive (see map below) to clean up Still Creek then return to Still Creek Press’ HQ for a BBQ and refreshments to celebrate the great work in cleaning up the area! To engage the business community in taking part, we utilized printed invitations sent through Canada Post’s Addressed Admail service. At $0.50 per unit this was a cost-effective method to promote the event through services we provide for our customers. We encourage other businesses to create their own Shoreline Cleanup to keep their surrounding business area as clean and friendly as possible.